This time of year is usually time for burrowing in and getting ready for the cold months ahead. The storm windows come down, the heat goes on, and our menu shifts to comfort food. Comfort food at my house might be casseroles or hearty stews. It can also be a variety of cold weather vegetables. Sometimes they are served as side dishes, but I’m just as happy to surround a pile of grains with a trio of different vegetables for a meal. I just got Melissa Clark’s new cookbook Cook This Now. I became a huge fan after I devoured her previous book In the Kitchen with a Good Appetite over the summer. I feel like she cooks so many of the same things that I like to cook and eat. Her new book is organized by month, with recipes that match the food that’s in season. There are so many new recipes to try. I jumped right into November’s selections with her Roasted Squash with Honey, Smoked Paprika, and Sage Salt. I didn’t have any acorn squash, but peeled and sliced a large nearly 3-pound butternut squash for a delicious result. 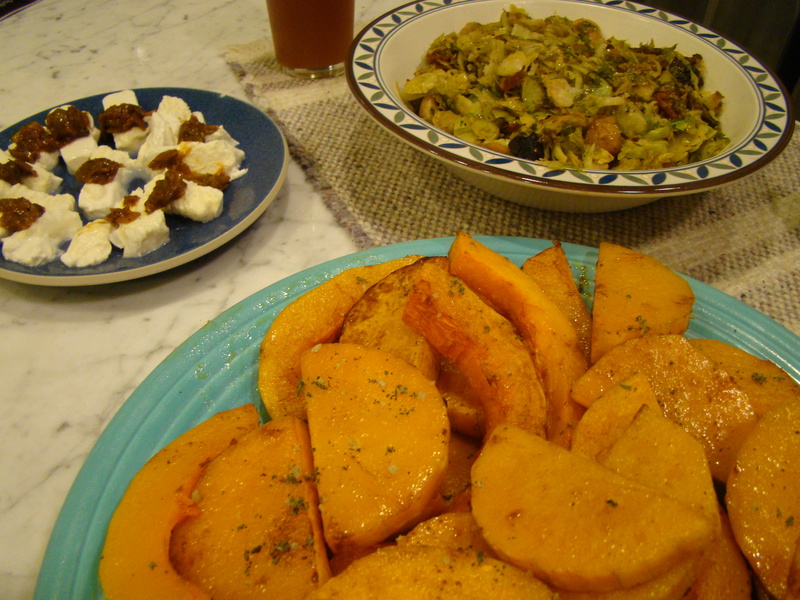 The seasonings are blended in oil to coast the squash before roasting. I think my favorite thing about this recipe was the discovery of how easy it is to make your own herbal salt. I baked some freshly picked sage to dry it out, then crumbled it into coarse sea salt. It was a great accent to the squash, but I’m enjoying sprinkling it on other dishes as well. What a great technique that I can use with other herbs. I have to hurry and try some other variations before the frost gets my herb garden. There was a bag of Brussels sprouts in the refrigerator. While my favorite preparation of these is to roast them, I wanted to try this Mark Bittman recipe that sautés thinly sliced Brussels sprouts with bacon and dried figs. A drizzle of balsamic vinegar tops it off. The sprouts just seem to melt in the pan, and the contrast of the salty and sweet with the earthy vegetables was great. It’s nice to have a fast option up my sleeve. Sauteed spinach rounded out the plate. First, I sauté some garlic in olive oil. Then, I toss spinach leaves, torn into bite-sized pieces, into the pan. The spinach was washed and drained, but not dried. Put the lid on the pan, and the spinach will steam in the water clinging to the leaves. Once it has wilted, I take the lid off to let the remaining moisture evaporate. Finally, I sprinkle the spinach with a handful of chopped lightly salted almonds. Whole wheat couscous, cooked with sautéed onions with some pine nuts mixed in filled the center of the plate, and it was dinner. Preheat the oven to 350F. Peel the squash, cut (carefully) in half lengthwise. Scoop out the seeds from the center, then cut into ½-inch slices. Place the squash in a large bowl. In a small bowl, combine the oil, honey, smoked paprika and kosher salt. Drizzle this mixture over the squash, scrapping every last bit out of the bowl, and toss well to coat the squash. Arrange the squash slices in a single layer on a large baking sheet (or two). Place the sage springs in its own, smaller, baking dish. Put all the pans in the oven. Roast the sage until just crisp, about 10 minutes, then remove from the oven. Let it cool. Raise the oven temperature to 400F. Continue roasting the squash for 20 to 25 more minutes, flipping the slices over once, about halfway through. The squash should be tender and lightly browned. Meanwhile, once the sage is cooled, in a small bowl, crumble the leaves into the coarse sea salt and combine (discard the stems). Sprink the sage salt over the squash slices when serving. If you’ve stuck with me this far, here’s a picture of my latest knitting project, a sweater for my friend Lauren’s toddler. This was such fun to make. 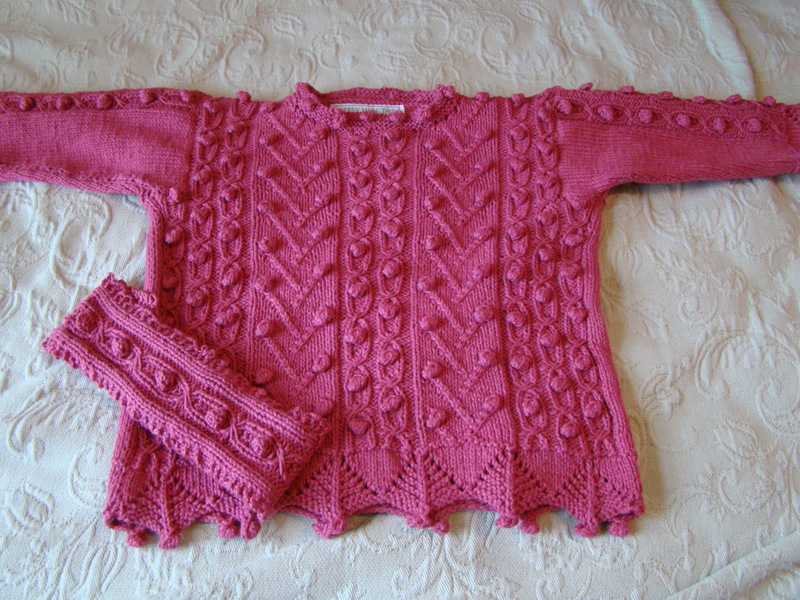 I’d love to make an adult sized version of the same sweater for myself. We’ve been having perfect soup weather, and there’s nothing that makes my house happier than a big pot of soup. Having such a treasure in the fridge makes our week go more smoothly, having something delicious and nutritious to bring for lunch everyday. For French Fridays with Dorie, the recipe this week was just that. Spiced Squash, Fennel, and Pear Soup had autumn all over its name. 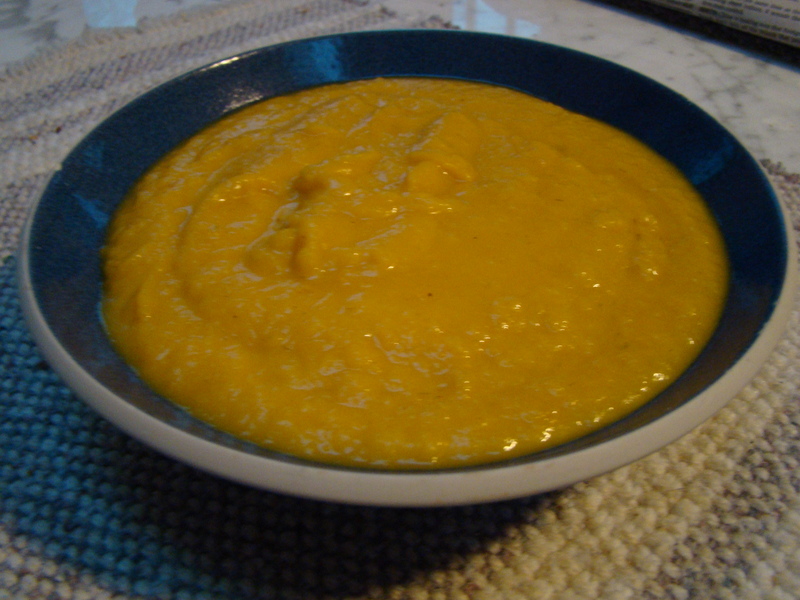 I’m always trying different winter squash soup recipes. I haven’t quite found that perfect go-to recipe. Really, I think the success of each batch depends on the squash itself, and the flavor of the squash can be wildly inconsistent. I was excited to try this one to see how it stood up to other recipes. My husband Howard doesn’t eat fruit in his food. He just eats fruit as fruit. And, while he likes apples, Howard does not care for pears. So, I was a little furtive about the reason for pears in the grocery bag. 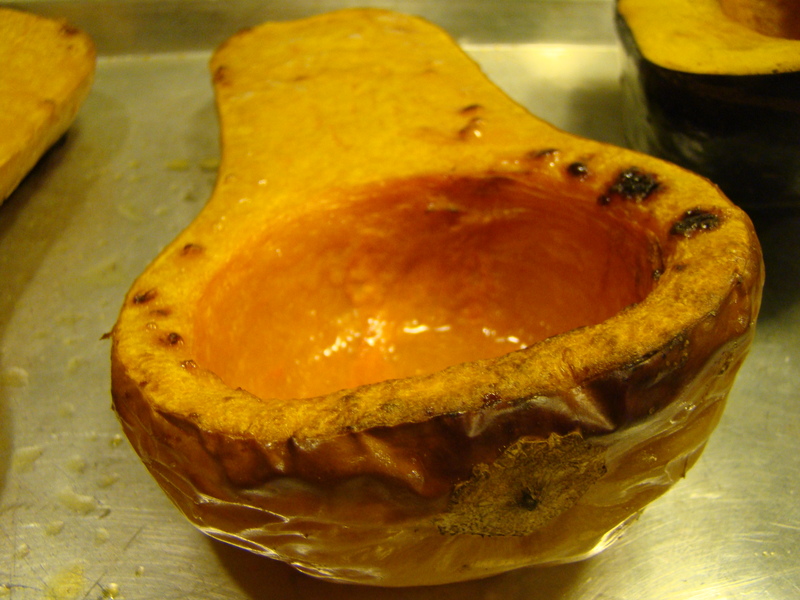 I roasted the halved butternut and buttercup squash. I peeled and chopped the cooked squash and lined it up on the counter next to bowls of chopped onions and scallions, fennel and garlic, and the spice mix of cumin, ginger, and nutmeg. The pears just patiently sat on the counter. Then I started to cook the soup. I didn’t want to chop the pears because I didn’t want them to brown while they waited for their turn to go into the pot. This whole time, I was alone in the kitchen. Howard: What are those pears for? H: Those aren’t going in to the soup, are they? B: (guilty look) You weren’t supposed to see them. H: I can’t believe you you’re going to poison me. B: You aren’t even going to taste them. H: I’ll know they’re there. At this point, he left the room, and I added the pears to the pot. So much for being sneaky. Once all the ingredients are tender, the mixture is pureed in the blender where it transforms into a smooth, golden soup. Mine was thick, and I opted not to thin it down with additional water or broth, but you could. I ended up with a HUGE container of a wonderful soup that has lasted all week. The squash itself might have been bland, but the fennel added depth beyond the usual onions, and the spices added a nice warmth. Those pears were the secret weapon. I couldn’t taste a distinct pear flavor, just an extra sweetness. I think adding some fruit might be the solution to earlier failed squash soup recipes with potential. Did Howard eat the soup? He grumbled a little bit, and insists he can taste the pears, but he took it for lunch every day (he’s in charge of making the lunches we bring to work). He did admit that it was a good soup. I’ll call that a success. As a side note, last week, I tried Béatrix’s Red Kuri Soup (page 78) because I had happened on red kuri squash at one of the last Farmer’s Markets of the season. If you haven’t tried that one (which I think is somewhat ingredient-dependent), it was also a winner. I’m looking forward to reading about what my fellow FFwD bloggers thought about this week’s recipe. Check out their links at French Fridays with Dorie. We don’t post the recipes, but consider getting your own copy of the book, Dorie Greenspan’s Around My French Table. Maybe you’ll even want to cook along with us on Fridays. It’s a great group, and you’d be quite welcome.